After moving into a house with a living room, a dining room, a kitchen, two bathrooms, and three bedrooms covered in wallpaper, I've learned a thing or two about getting it down. 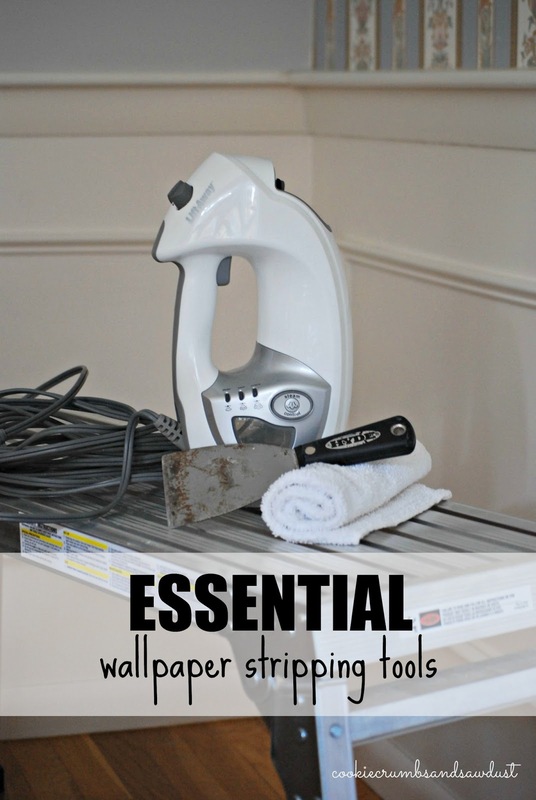 The first step to stripping wallpaper is having the right tools. After trying various methods and tools, I've narrowed it down to four tools. My Shark mop has a lift away steam unit. This is a life (and a time!) saver when it comes to wallpaper stripping. I would even consider purchasing it just for this feature. If you don't have a steamer, ask around. One of your friends or relatives probably do. You will need a metal scraper. Chances are good you already have one around the house. If not, they are readily available at the hardware store. As you can see, mine is well used. Remember to scrape at a 45 degree angle. I find it handy to have an old rag nearby to wipe up excess water drops or stubborn glue. I just throw mine in the laundry with all my other dirty work/cleaning rags. I'm petite, so a platform is absolutely necessary to just to reach my short ceilings. You could use a step stool, but a work platform gives you about four feet before you need to hop down and scoot your self over. We bought ours on sale at the home improvement store, and it makes all DIY projects much easier. Do you have experience stripping wallpaper? What have you found that works best? Stay tuned for next week, when we'll go into detail on how to use these tools to get that pesky, ugly, outdated, or stubborn paper off. This post may contain affiliate links to products that you can buy. Purchasing through one of these links doesn't cost you anything extra, but it earns me a small commission that helps keep CookieCrumbsandSawdust going. Thanks for your support! Oh, I remember the days of stripping paper in our house. UGH! Glad to see you back blogging. I have stripped wallpaper in 3 room and 1 bathroom so far, I still have 3 bathrooms and a huge room to go...I use a steamer made to strip wallpaper, but I also have used a 1 to 3 ratio of Downey to water as a stripper spray and it actually works pretty well and smells a heck of a lot better than stripper. It's probably not super necessary with the steamer, but our wallpaper is old and thick so I think it helps dissolve the glue some.